Since we really wanted to put on the oven, we chose some Chicken Tikka Samosas from Trader Joe’s for $3.99 or $2.00 per serve. Thin cut pork chops with apple bacon slaw is becoming a cliche, although tonight’s slaw was based on a “cruciferous crunch” mix with the apple and bacon. The salad made four serves. Add 20c for apple cider vinegar and seasoning. Dinner tonight was a great meal for $7.25 per serve. 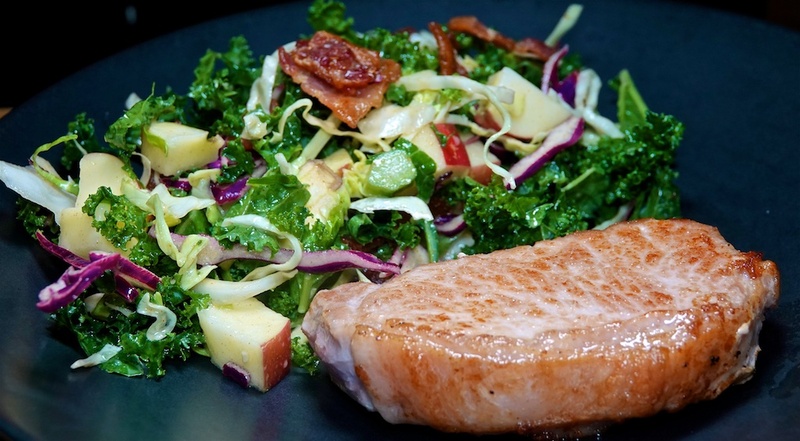 The pork chop was perfectly medium rare, and the salad had a great balance of acid, crunch, sweetness, salt and fat!